"It is an honor for Purina to sponsor the Westminster Kennel Club Dog Show," said Nina Leigh Krueger, President, Nestlé Purina PetCare. "Purebred dog enthusiasts aspire all their lives to show their dogs at this prestigious show. The opportunity to partner with Westminster for the next 10 years allows us to work together to celebrate all dogs and to spread the word about responsible dog breeding and ownership." "We look forward to our long-term partnership with Nestlé Purina PetCare," said Westminster Kennel Club President Seán W. McCarthy. "When an iconic institution such as Westminster combines with the premiere brand Purina Pro Plan, everyone benefits from the amazing dog show experience. From lifelong breeders to first-time spectators, Westminster Week delivers discovery, shared knowledge, education, and elite competition." The Westminster Kennel Club has transformed its annual all-breed dog show into Westminster Week, a blend of activities that spotlight purebred dogs and popular companion sports that people can enjoy with their dogs. Starting with "Meet & Compete," which combines the AKC Meet The Breeds® Presented by Purina Pro Plan and the fourth annual Masters Agility Championship at Westminster on Saturday, Feb. 11, it is followed by the 141st annual all-breed dog show Feb. 13 and 14, and the second annual Masters Obedience Championship at Westminster Feb. 13. Purina Pro Plan is the exclusive pet food sponsor of all the Westminster activities. About Westminster Kennel Club – The Westminster Kennel Club is America's oldest organization dedicated to the sport of purebred dogs. Established in 1877, Westminster's influence has been felt for more than a century through its famous all-breed benched dog show held every year at New York City's Madison Square Garden. Today, America's dog show has expanded into Westminster Week, which includes the Masters Agility Championship at Westminster and the Masters Obedience Championship at Westminster, both held at Piers 92/94. More than 3,000 dogs from the U.S. and abroad make Westminster Week like no other. Westminster. There's only one. 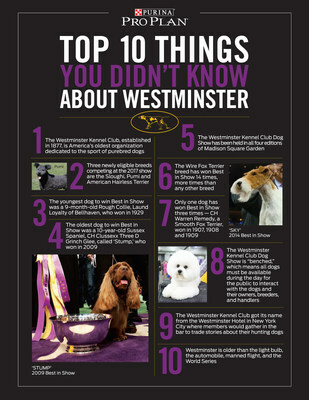 Visit us at www.westminsterkennelclub.org or follow @WKCDOGS. 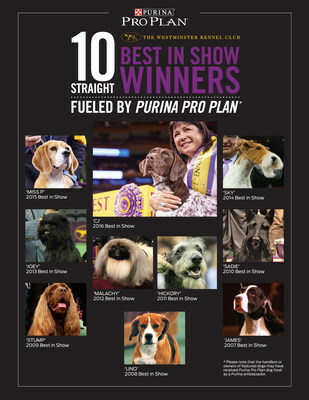 About Purina Pro Plan – Purina Pro Plan is the food of choice for the past 10 Westminster Best in Show winners. * Our goal is to give your dog the nutrition to be his absolute best, helping him or her to be energetic and resilient and to maintain an ideal body condition, healthy skin and a stunning coat. Because being the best he or she can be means something different for every dog, our wide range of dry and wet foods and snacks, sold exclusively at pet specialty stores, can be found in four specialized categories formulated for a dog's unique needs. For more information, visit www.proplan.com or follow @ProPlan on Twitter, Instagram, Facebook, or Google+. The brand is manufactured by Nestlé Purina PetCare, which promotes responsible pet care, humane education, community involvement, and the positive bond between people and their pets. A premiere global manufacturer of pet products, Nestlé Purina PetCare is part of Swiss-based Nestle S.A., a global leader in nutrition, health and wellness.